Wristwatches are a relatively modern custom. Until the early 1900s, watches used to be pocket timepieces (even though early exceptions exist). It is only with the advent of WWI that officers began wearing watches on their wrist for true life-or-death reasons: the few additional seconds and the loss of concentration due to the extraction of the watch from the pocket might lead to dire consequences in the trenches. Once the conflict was over, however, the public realized how much more convenient having a watch on the wrist is even in non-conflictual circumstances, and the trend caught on. 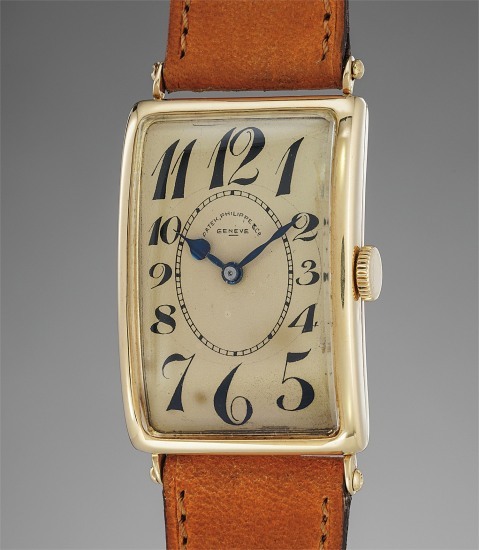 The present piece is thus an extremely early example of wristwatch, produced in 1919 and sold on June 12, 1920. Beyond the historical interest, it is undeniable that the piece is stunning: the gilded dial with enameled Breguet numerals - a configuration fully confirmed by the extract - is simply breathtaking, wonderfully executed and in surprisingly good condition for a timepiece more than a century old. Additional details such as the oval railway divisions, curved Patek Philippe & Co. signature and caseback signed and bearing the case number to the outside - all excellently preserved - add to the already enormous charme and appeal of this fascinating timepeice.